← Romance Novel WISHING ON A STAR on Sale-$2.99! 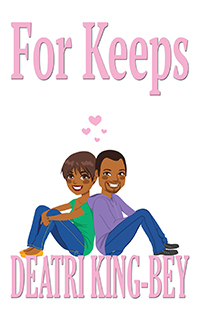 I’m honored to have my friend, award-winning author Deatri King-Bey, as a guest blogger, introducing her latest release, FOR KEEPS. This entry was posted in Black Romance Novels (African American), Books- Writing and tagged African American, Black hero, Black heroine, Black Women, book, Deatri King-Bey, novels, reading, Sistahs. Bookmark the permalink.